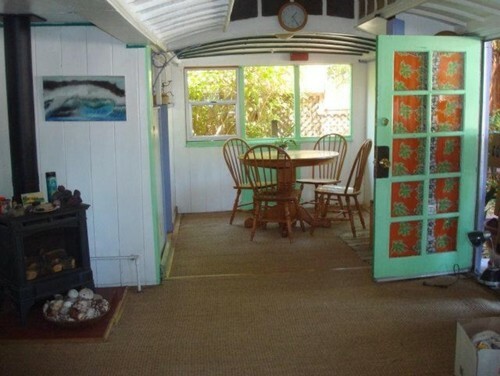 This week's featured small space is a beach house in Santa Cruz, California that may surprise you. 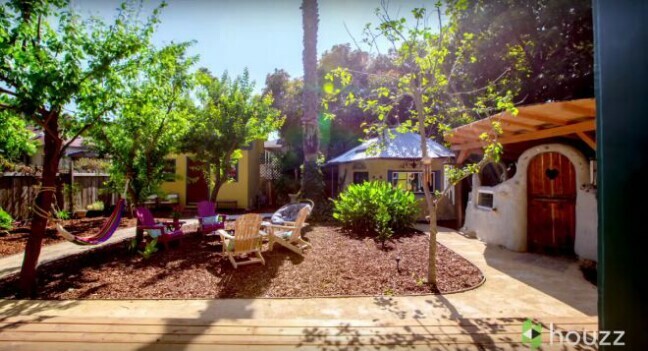 When Mary and Gerhard Ringel first saw the little house that would eventually become their home they had no idea what lie in store for them inside. 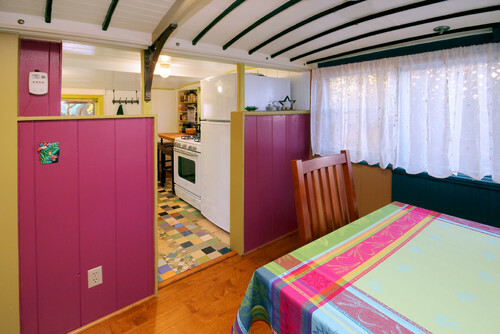 From the outside it looked like an ordinary little beach cottage, but once inside Gerhard told his wife they were standing in a streetcar, and that, in fact, there were two streetcars that comprised the home. Mary was "blown away". 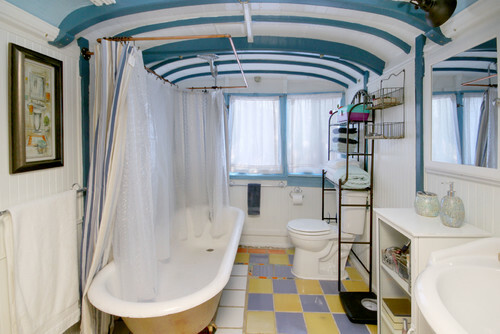 The two cars are covered by a regular roof, which explains why from the street one would never know the house is made from two decommissioned streetcars from the early 1900's. The two cars were set next to each other, with a 3½ -foot space connecting them. 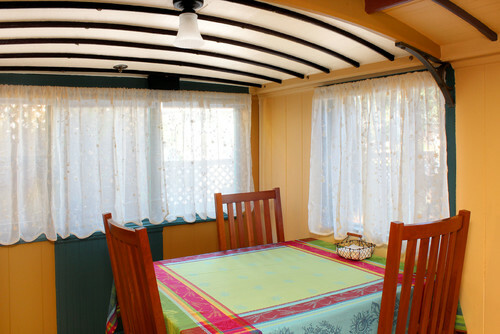 The first streetcar is comprised of the living and dining room. The second houses the bathroom, bedroom, and kitchen. 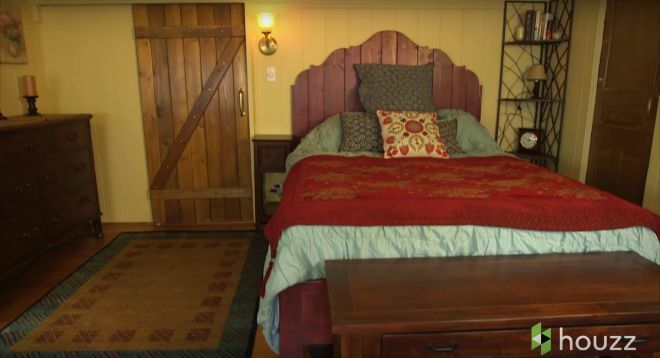 An addition on the back extends the bedroom by 8 feet, bringing the total size of the home to 750 square feet. Quite a downsize for the Ringels, whose former home was 2,500 sq ft.
As this before photo shows, when the Ringels purchased the home it needed a lot of work. The streetcar ceiling above the TV was sagging 2 inches which caused Gerhard to duck every time he came into the living room. He jacked up the ceiling himself and reinforced it with 2-by-8s. When they moved in the streetcar windows were a faded acrylic plastic. Gerhard built light boxes with led lights inside. To create the look of stained glass he had acrylic panels cut in various sizes, then bought window film that has a faux stained glass pattern and he and Mary put the film onto the acrylic panels. Next Gerhard built light fixtures to illuminate the panels from behind. The panels are equipped to change colors as desired, from blue moon to red sunset. 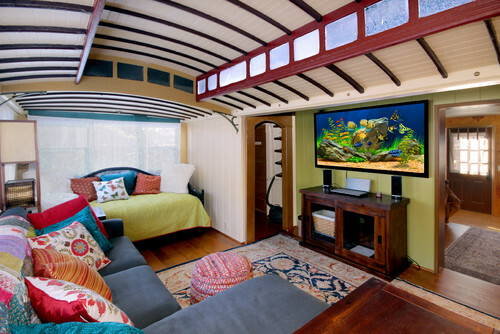 A daybed in the living room's nook serves as extra seating, or a bed for guests. The Ringles removed all the flooring and installed hardwood in the living room and bedroom, and replaced rough red tiles below the gas heater with granite. The cherry dining table is one they brought from their previous home. Gerhard cut it down to fit in their new dining space. Above the doorway to the kitchen is an original cast iron bracket, one of many found throughout the streetcar structure. The kitchen spans the 3½-foot space connecting the two streetcars as well as part of one of the streetcars. The ceiling was installed by a previous owner, as was the tile on the floor and counter. 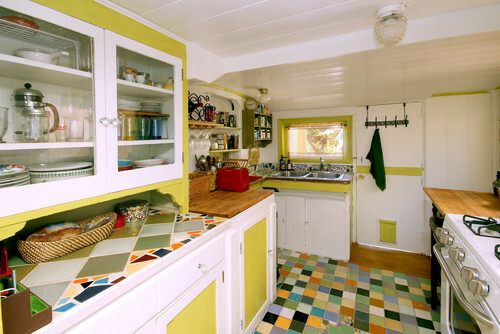 Original to the home, the kitchen cabinets were repainted in white and apple green. When the Ringles took possession of the house the cabinets were painted orange, mint green and yellow. 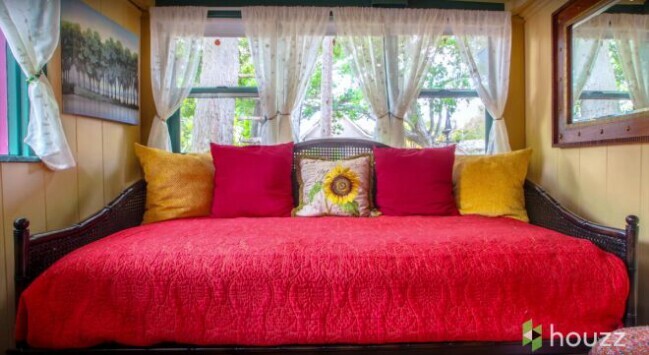 Originally, the cottage was painted in "a lot of crazy colors. . .very Bohemian". The Ringles wanted to "keep the energy" which is part of Santa Cruz, but as grandparents felt they needed to tone it down a bit. The interior and exterior color palette was chosen with help from local artist and painter Gregory LeBaron, who also did all the painting. 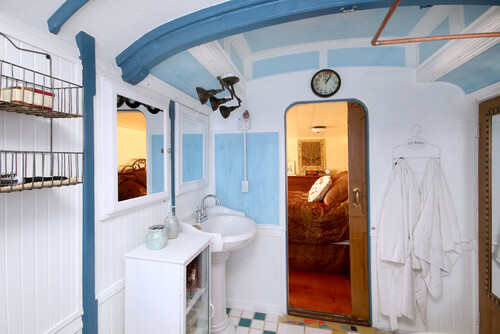 They restored the clawfoot tub, and LeBaron created a custom paint and sponged it onto the sides. Gerhard designed and built the copper shower curtain rod to give the tub the feeling of more space. Surface-mounted medicine cabinets were replaced with recessed ones and a pedestal sink was added.The door is original to the streetcar. “It makes a rumbling sound like rough wheels rattling over a metal track.” Out of respect for the history of the streetcar, they kept the door. 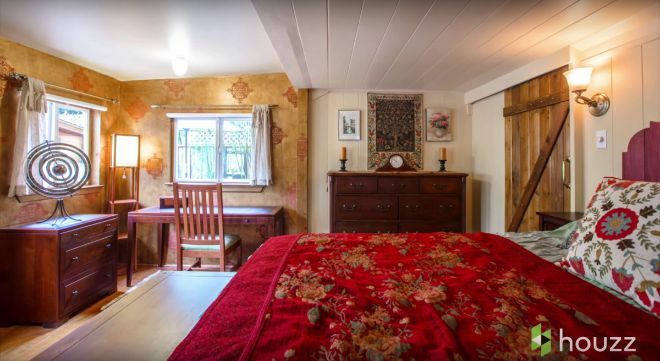 With the 8 foot addition, the bedroom in this small home is spacious. The door leads to the backyard. Several cob structures surround the outdoor living space. Cozy, cheery and full of charm. 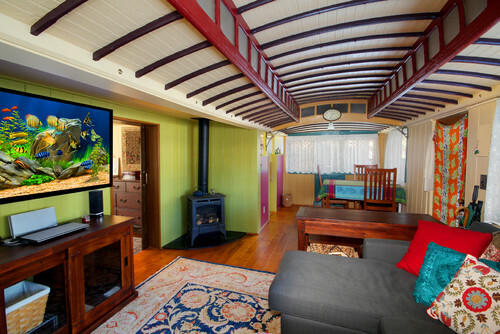 I love this funky little cottage. You can see more of this home, including a video that gives a full tour of the home on Houzz here. The OUTSIDE is just as fabulous as the inside! This may be my favorite, Nancy. Glad you liked it, Sandi! I think it's a fun, fun place. Wow, I love this home! The design, the colors, and the lighting make it appealing to me. 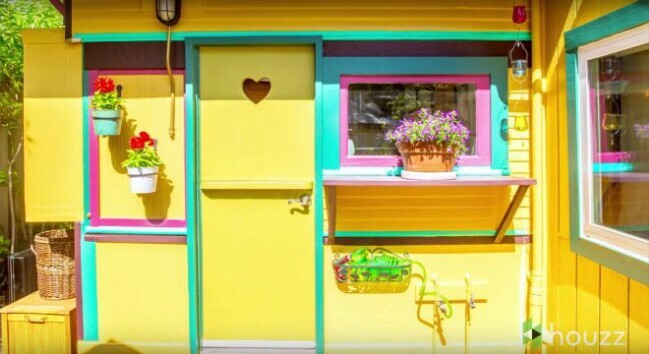 I love bright colors and quirky homes. This is so cute. And the little courtyard is the icing on the cake. Great choice. This home makes me smile . 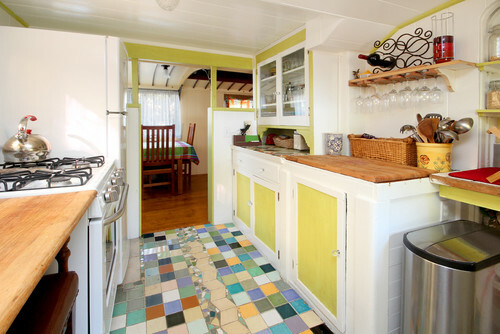 . . love the quirky colors and all the charming details . . . Everywhere! I do believe it would be almost impossible to ever have a sad day living in this space. Love It!!! Very cheerful home for sure. How unique too. This was another good one Nancy. Happy 4th. Oh my......absolute imagination, genius and courage to take on a space as such and make it work. Which reminds me, we are now watching the British show, GRAND DESIGN. I think you and Dennis would like it. Speaking of COB structures, there is one in this show that will blow you away! Fun little cottage . . .
Off I go to watch the video! This is a sweet, little place! My sweetheart went to college in this community and there are quite a few cottages that are very different and fun. This one fits in perfectly! They did a fantastic renovation job. Loved seeing it. Thanks for sharing it. I bet their grandchildren love to visit there! Now that is a neat house. Love the outside and the ceilings and the whole transformation. I am not sure I could live there full time with all that color (I know...this coming from the red girl!! ), but it would be a really cool place to vacation or visit. 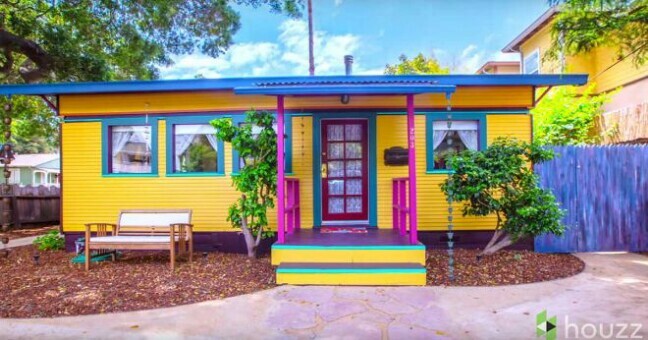 What a cute and colorful beach cottage! A fun little place to live in for sure. I feel so happy looking at each room. The kitchen floor reminds me of a quilt. Yes. Very California but I like it. My mother, who always had a thing for train cars, would have loved it. This house is really one of a kind, but I like the way the space is used.